Apron/Collar Case, Los Angeles Fraternal Supply Company Inc. 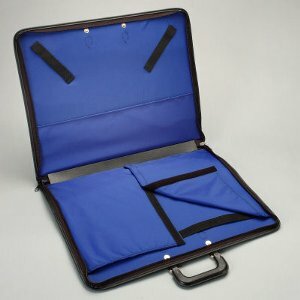 This Apron/Collar case is designed to hold one apron and one collar. It has 'hook & loop' straps to hold the collar in place on one side and two fold-over flaps to protect the apron on the other. It will hold one apron that is 13 x 15 inches or 14 x 16 inches. This case is made in USA.